MagnaSpread Hydraulic Granular Fertilizer or Lime Spreaders - The BBI MagnaSpread line of Hydraulic Fertilizer Lime Spreaders are optimized for Precision Agriculture. BBI has Five MagnaSpread Brands optimized for various applications.. 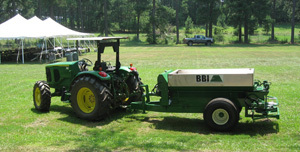 The BBI Binary Manifold is STANDARD on ALL of our Hydraulic Spreaders in both the MagnaSpread - Fertilizer Lime Series AND the Endurance - Litter, Lime, Shavings and Organics Series. All BBI MagnaSpread units come equipped with the proprietary BBI Binary Manifold which makes use of all electronics a Snap! Spreads lime at up to 2 tons per acre at 14 mph with a 60 ft swath. Spreads Fertilizer with 80 foot plus swaths! Our ﻿MagnaSpread 10' or 12' Tandem Axle Hydraulic Spreader ﻿is perfect for Fertilizer or Lime Applications - Distribution of Granular Fertilizer or Lime - BBI Binary Manifold Equipped - Option Rich - Customized for your specific application - Precision Fertilizer, Lime and Organics Spreader - Medium Capacity - Variety of Applications - PTO or Hydraulic Powered Driven Spinners - Spreads Fertilizer in 80' PLUS swaths! MagnaSpread 10' or 12' Tandem Axle Fertilizer Lime Spreader - Distribution of Granular Fertilizer or Lime - Option Rich - Customized for your specific application - Precision Fertilizer, Lime and Organics Spreader - Medium Capacity - Variety of Applications - PTO or Hydraulic Driven Spinners - Spreads Fertilizer in 80' PLUS swaths! The BBI Binary Manifold is STANDARD on all MagnaSpread units! The BBI Binary Hydraulic Manifold system combines the hydraulic controls for the conveyor and spinners into one control manifold. It includes proportional manual speed control for both spinners and conveyor. Pilot operated relief is standard. A dump valve and a GR is standard for the conveyor. The modularity of the BBI Binary Manifold allows for quick, easy conversion to GR option and to electronic control. Spreads Lime at up to 2 tons per acre at 14 mph with a 60" swath. UHMW Bearing Back keeps bearings clean, giving longer bearing life and fewer failures. Suggested Use Distribution of Granular Fertilizer or Lime - Option Rich - Customized for your specific application - Precision Fertilizer, Lime and Organics Spreader - Medium Capacity - Variety of Applications - PTO or Hydraulic Driven Spinners - Spreads Fertilizer in 80' PLUS swaths! 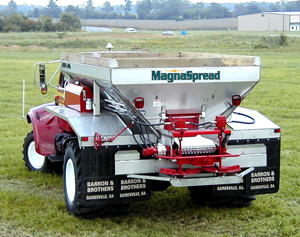 MagnaSpread 10' Single Axle Fertilizer Lime Spreader for Distribution of Granular Fertilizer or Lime - Medium Capacity - High Clearance - Classic Single Axle Applicator for Turf Farms, Pastures and Row Crops. Designed for High Clearance to straddle rows. Advanced Technology for the most sophistocated farmer! ALL BBI MagnaSpread units come with the BBI Binary Manifold which makes use of electronics a SNAP! Spreads Lime at up to 2 tons per acre at 14 mph with a 60' swath. Suggested Use: Distribution of Granular Fertilizer or Lime - Medium Capacity - High Clearance - Classic Single Axle - Applicator for Turf Farms, Pastures and Row Crops. Designed for High Clearance to straddle rows. Advanced Technology for the most sophistocated farmer! ﻿MagnaSpread 14' or 16' Tandem Axle ﻿Fertilizer Lime Spreader - High Capacity - Pull Type - Distribution of Granular Fertilizer or Lime - Option Rich - Customized for your specific application - Advanced Technology for the most sophisticated farmer! Spreads Lime at up to 2 TONS per acre at 14 mph with a 60' swath - Spreads Fertilizer in 80' PLUS swaths! Suggested Use For precision distribution of Granular Fertilizer / Lime on large acerage farms and custom applications. 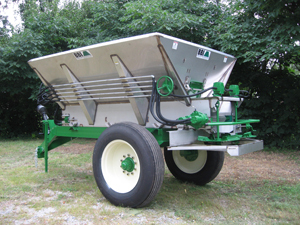 ﻿8 ft MagnaSpread Single Axle ﻿Granular Fertilizer Lime Spreader with Ag and Turf design. Low Profile - Low Center of Gravity - Pull with a LOW HP Tractor. All BBI MagnaSpread units come equipped with the proprietary BBI Binary Manifold which makes use of all electronics a Snap! Spreads lime at up to 2 tons per acre at 14 mph with a 60 ft swath. Spreads Fertilizer with 80 foot plus swaths! BBI MagnaSpread 8' Single Axle Fertilizer - Lime Spreader is designed to be tough, easy to use and maintain and the "Lowest Cost in Use" Spreader on the Market. All BBI MagnaSpread units come equipped with the proprietary BBI Binary Manifold which makes use of all electronics a Snap! Spreads lime at up to 2 tons per acre at 14 mph with a 60 ft swath. Spreads Fertilizer with 80 foot plus swaths! Proprietary BBI MagnaSpread spinner system delivers a wider, flatter, more consistent pattern. MagnaSpread is READY for Variable rate technology or straight rate control. 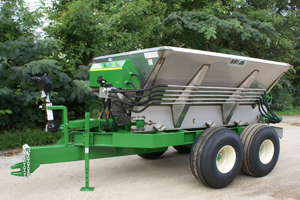 BBI Spreaders are Option Rich and can be customized to your specific application. Flotation tires and wide swath minimize soil compaction. Suggested Use: For precision distribution of Fertilizer/Lime on large acreage farms and custom applications. Want to see more spreaders? 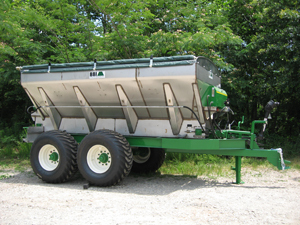 Click HERE to return to our Spreader main page.